OpenSource Conference (OSC) was held in Iwate for the first time. Ichinoseki hosted the OSC on April 21. 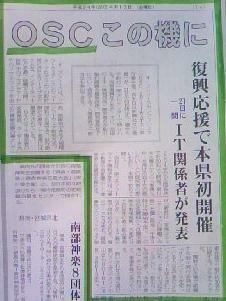 April 13th Iwate Nichinichi Shimbun carried an article "OSC the chance." 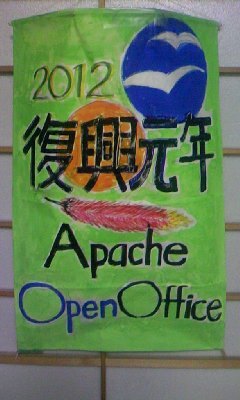 I made a presentation on Apache OpenOffice with a kite I made with my daughter for the new year 2012. I also showed Magokoro Project activity and OpenOffice.org 3.3.0 CDs. 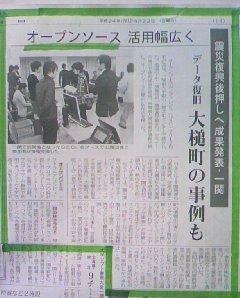 April 22nd Iwate Nichinichi shimbun carried an article "OpenSource can be used in a wide range."